How does diabetes affect the retina? Patients with diabetes are more likely to develop eye problems such as cataracts and glaucoma, but the disease s affect on the retina is the main threat to vision. 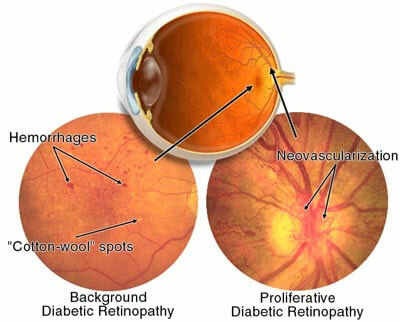 Most patients develop diabetic changes in the retina after approximately 20 years. The effect of diabetes on the eye is called diabetic retinopathy. The next stage is known as proliferative diabetic retinopathy. In this stage, circulation problems cause areas of the retina to become oxygen-deprived or ischemic. New, fragile, vessels develop as the circulatory system attempts to maintain adequate oxygen levels within the retina. This is called neovascularization. Unfortunately, these delicate vessels hemorrhage easily. Blood may leak into the retina and vitreous, causing spots or floaters, along with decreased vision. In the later phases of the disease, continued abnormal vessel growth and scar tissue may cause serious problems such as retinal detachment and glaucoma. Blurred vision (this is often linked to blood sugar levels Floaters and flashes Sudden loss of vision). Diabetic retinopathy is treated in many ways depending on the stage of the disease and the specific problem that requires attention. The retinal surgeon relies on several tests to monitor the progression of the disease and to make decisions for the appropriate treatment. These include: fluorescein angiography, retinal photography, and ultrasound imaging of the eye. Ocular coherence tomography is an exciting new non-invasive test that can detect diabetic macular edema with great accuracy. When diabetic macular edema gets severe enough, focal retinal photocoagulation is recommended. This decreases the rate of vision loss by 50%. The abnormal growth of tiny blood vessels and the associated complication of bleeding is one of the most common problems treated by vitreo-retinal surgeons. Laser surgery called pan retinal photocoagulation (PRP) is usually the treatment of choice for this problem. With PRP, the surgeon uses laser to destroy oxygen-deprived retinal tissue outside of the patient's central vision. While this creates blind spots in the peripheral vision, PRP prevents the continued growth of the fragile vessels and seals the leaking ones. The goal of the treatment is to arrest the progression of the disease. Corticosteroids in the eye are being investigated as an alternative and/or supplement to laser therapy. The doctors and staff at Retina Care Specialists are involved in a research protocol where a sustained release steroid called Posurdex is injected into the eye. Early results are exciting, sometimes resulting in an improvement in vision.